A fun fact is that the technique has actually been developed by one company that is now part of Deltares! According to wikipedia this is also called Dutch cone test sometimes. This information is normally projector on a computer. 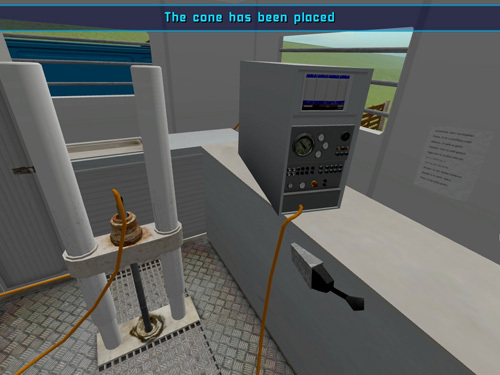 The CPT-Operator can tell from the graphs what kind of soil the cone is currently at. These CPT's can take a while, as the industry norm is about 2 centrimetres a second. This means it can sometimes take quite a while to find an appropriate foundation layer! Fortunately in this serious game, time does not equal 'real-time' and things can happen a bit faster. Of course, the CPT-Operator has to make sure that the testing does not exceed the 2 cm/s, the cone is in a proper shape, and the truck doesn't pass bridges which cannot hold heavy trucks! We also made the interior of the truck, and actually recreated the display which the CPT-operators normally see; showing the friction, angle, pore pressure graphs. The CPT-Operator game has been created using Epic's Unreal Engine2 Runtime. 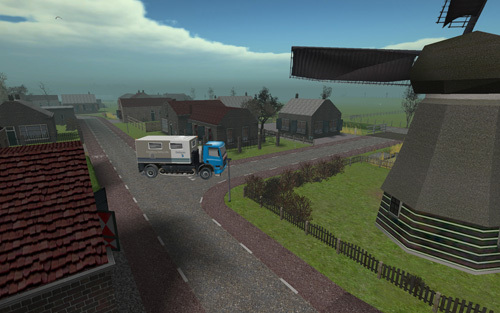 This game was the last game at Deltares to be developed using UE2. All other games have been developed in the Unity 3D engine to have more flexibility and platform independent options. Visit the official CPT-Operator game website at Deltares.